The US and Russia have agreed to work towards cutting deployed nuclear warheads to as few as 1,500 each under an agreement signed by Barack Obama on his first trip to Russia as president. 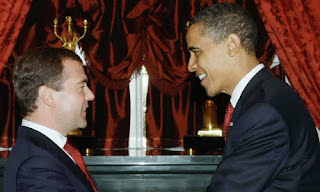 Obama and the Russian prime minister, Dmitry Medvedev, (LEFT) signed a framework deal aimed at cutting warheads to a maximum of 1,675 within seven years of a nuclear arms reduction treaty coming into force. Current treaties allow for a maximum of 2,200 warheads, though both sides are thought to have more than that deployed, or capable of launch. According to some expert estimates of current numbers, the new commitment would mean each side scrapping almost 1,000 warheads. The pact signed today also calls for the number of strategic delivery systems to be reduced to between 500 and 1,100 on each side, from 1,600 under current treaties. Such systems include intercontinental ballistic missiles, submarine-launched missiles and heavy bombers. Obama said he intended to host a summit on global nuclear security next year. Among a flurry of other bilateral announcements today, Russia said it was prepared to let the US fly troops and weapons across its airspace to Afghanistan. "We must lead by example and that's what we are doing here today," Obama said of the preliminary nuclear accord. "We resolve to reset US-Russian relations so that we can co-operate more effectively in areas of common interest." Medvedev said today's summit was a "first step, but a very important step" towards resetting relations. Obama and Medvedev agreed during their last meeting in April to hold talks on a successor treaty to the 1991 Start-1 pact, which expires in December. But attempts to reach a deal have been aggravated by disagreements over the Pentagon's planned missile defence shield in Poland and the Czech Republic. Yesterday, Medvedev said any new arms reduction treaty was definitively "linked" to America's missile defence ambitions in central Europe. "We consider these issues are interconnected," he said. "It is sufficient to show restraint and show an ability to compromise. And then we can agree on the basis of a new deal on Start." Obama responded by saying that he would complete a review of the need for the missile defence shield in the next two months, and would then re-address the issue with the Russian government in search of a definitive agreement on the issue. In an interview today with the Russian opposition newspaper Novaya Gazeta, Obama stressed that the missile defence system was not aimed at Russia but rather intended to protect the US and its allies from an Iranian nuclear missile. He acknowledged "Russian sensitivities" over the shield but said he hoped Moscow would "become a partner in the project". He made clear he would not accept Moscow's linkage between arms control and missile defence, a statement that suggests there is little prospect of a rapid breakthrough. Tomorrow, Obama he will meet Vladimir Putin, Russia's prime minister and the man who most people believe still runs the country. Obama described Putin slightingly last week as having "one foot in the past". Russia's state-controlled media have so far given Obama a less than overwhelming reception. The Kremlin-controlled Channel One TV last night failed to mention Obama's visit in its headlines, leading instead with a report on Medvedev's attempts to encourage energy conservation. The US and Russia account for more than 90% of the world's nuclear weapons. They have agreed in principle to reduce their nuclear warheads to a maximum of 2,200 warheads under the Start treaty. But until now they had not been able to agree on a reduction in the systems used to launch them.